‘Tis the season for deep-pitched brass instruments, apparently. 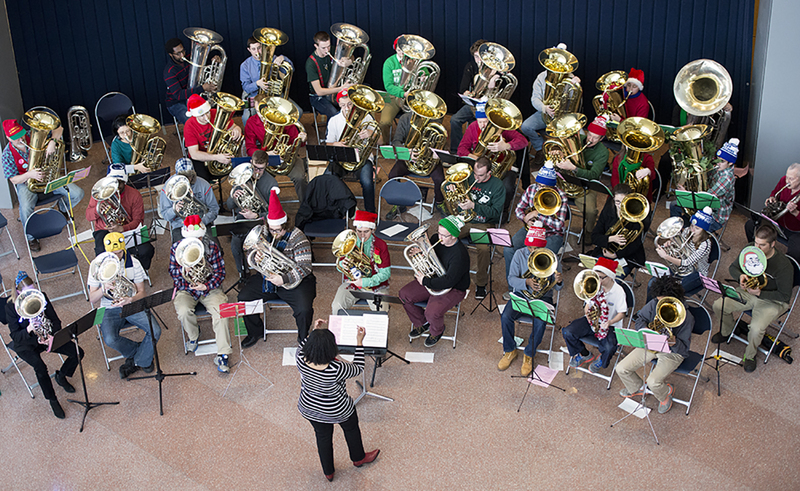 TubaChristmas at Penn State: Hark the Herald Angels Sing from The Penn Stater magazine on Vimeo. The woman conducting the 35-some players is Velvet Brown of the Penn State School of Music faculty. We profiled her in the magazine some years back. Since Saturday, I’ve discovered that she conducts the Penn State Tuba/Euphonium Studio in other specialty concerts during the year, like OctTUBAFest and TUBAWEEN. Who knew? Saturday’s performance included not only Penn State students but also people from the community—there was at least one 11-year-old and one 14-year-old among the musicians, and the prize for the oldest performer went to a guy who’s 78. Below are a few photos from Saturday’s concert. Entry filed under: University Park. Tags: euphonium, tuba, TubaChristmas, Velvet Brown. Two Dozen Trombones, Plus Santa Claus	Cuba! All this trombone coverage is wonderful. However, the alumni would be better served with your presence at and a review of yesterday’s (12/15) Board of Trustee’s meeting. When can we expect that blog?